Shuttlecocks – fungi designed them first! Fruiting bodies on underside of leaf. At this time of year the fruiting bodies of the powdery mildew species, Phyllactinia guttata, are easy to find on the underside of hazel leaves (Corylus avellana) on campus. The minute fruiting bodies – known as clasmothecia – can be seen as tiny specks that develop through yellow, amber and brown to black when mature. and short, thick-trunked appendages with a wealth of fine branches radiating from the tip. 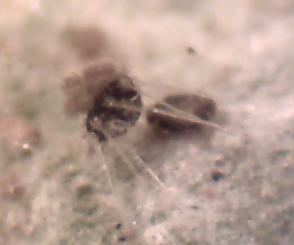 Bulbs at the base of needle-like appendages. Fruiting body or Martian machine from ‘War of the Worlds’? As the fruiting body matures the long appendages fold back causing the clasmothecia to rise up as if on stilts. This occurs because the bulbs at the base of the appendages have a thinner wall on the side closest to the leaf. As the bulb begins to dry, the thin wall shrinks more than the opposite side causing the appendage to turn towards the leaf. 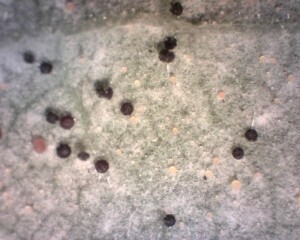 Sticky pad developing on top of the fruiting body. Meanwhile the tip of each branch on the smaller appendages produces a small droplet of sticky liquid creating a sticky pad on top of the fruiting body. Aerodynamically you have a shuttlecock. As air movements lift the ripe fruiting bodies from the leaf surface, the swept-back long appendages form vanes while the heavier mass of the black fruiting body leads the way… until SPLAT! – the sticky pad at the front of the shuttlecock hits something, dries, and sticks fast for the winter. 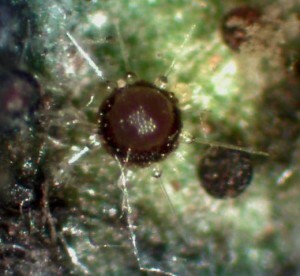 The fruit bodies produce relatively heavy spores (for a fungus). The shuttlecock design increases the probability that when those spores are released in the spring they will be up in the tree canopy rather than amongst leaf litter on the ground. Thousands of years before humans invented the game of badmington, a fungus was already using aerodynamic principles to stick its spore-releasing structures to twigs and branches in order to maximise the fitness of its species. Pretty impressive! This entry was posted in Fungi, Plant Pathology Research Group, Plants and tagged Corylus avellana, hazel, Phyllactinia guttata, Powdery Mildew. Bookmark the permalink.